Please join us in congratulating Susan Jones, Entomology, who on Dec. 9 received the Ohio Pest Management Association’s (OPMA) Distinguished Service Award. The award is given for outstanding service and support to the citizens of Ohio and the U.S. and to the pest management industry. Susan conducts Extension and research programs on the biology and control of termites, bed bugs, and other household and structural insect pests. 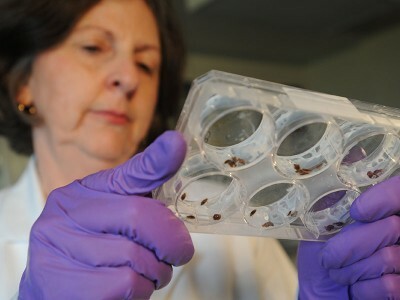 Her outreach efforts include serving as a member of the Cincinnati/Hamilton County Joint Bed Bug Task Force and as a member of the steering committee of the Central Ohio Bed Bug Task Force in Columbus and Franklin County. Watch a short video about some of her work here (2:15). OPMA works to promote education and ethics for the pest control industry and to foster research and the diffusion of knowledge of the industry among its members.